SUBJECT: This is a circa mid-1950s patch for the Douglas Aircraft Company, which manufactured aircraft in California from 1921 until 1967, when it became McDonnell Douglas. 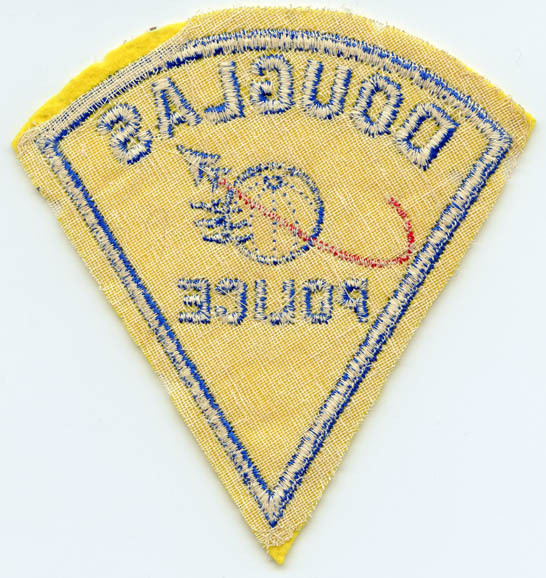 The patch is in yellow wool and is embroidered to show an aircraft passing a globe. This version of the patch shows a heavy contrail behind the plane. SIZE: Approximately 5� in height and 4-5/8� in width. CONSTRUCTION/MATERIALS: Wool embroidered in cotton/silk embroidery, mesh backing. CONDITION: 7- (Very Fine-): The patch shows some light to medium wear and some minor moth holes along the edge.